Our school leads the Harvest service in St Peter’s church. We help to decorate the church and after the service we distribute the Harvest collection of food to the elderly people in our parish and to the food bank in Lancaster. We shared a story about banana growers in other countries and explained how Fairtrade helps them to have a better life. 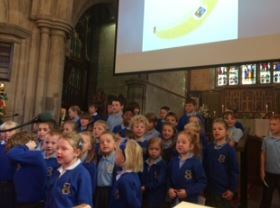 We even gave everyone in the congregation a banana!